Stage 1: Grow Passion Flower vines. Stage 2 brings us to yielding and harvesting Passion Fruits. We allowed our passion fruit vines to take over Mom's tomato raised bed. Their spiral tendrils gripped the San Marzano supports allowing the vines to quickly grow up towards the sky. Throughout the summer we enjoyed a spectacular show of extraordinary purple blooms. Passion flowers last for just a day before developing into fruit. The vines grew to the top of each tomato support and formed a huge canopy. 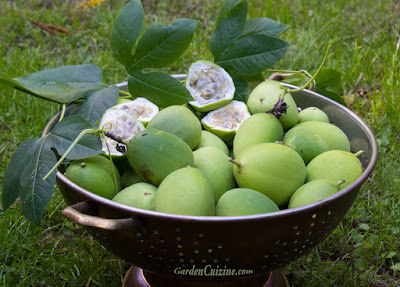 We soon discovered abundant, lime-sized, green fruits dangling beneath the vines. Unlike limes, passion fruit skins were smooth. At first, we weren't sure how to tell when they were ripe. But, it didn't matter once I heard the weather was going to dip to our first frost. I decided to pick all that I could gather before they were ruined. Some fruits were small, but I picked them anyway. Ideally, a longer growing season would have been nice. It would have been best to allow the fruits to ripen on the vines and fall to the ground. Our passion fruit harvest filled 2 large colanders! The majority of fruits were firm so I left them out on the kitchen counter this past week. 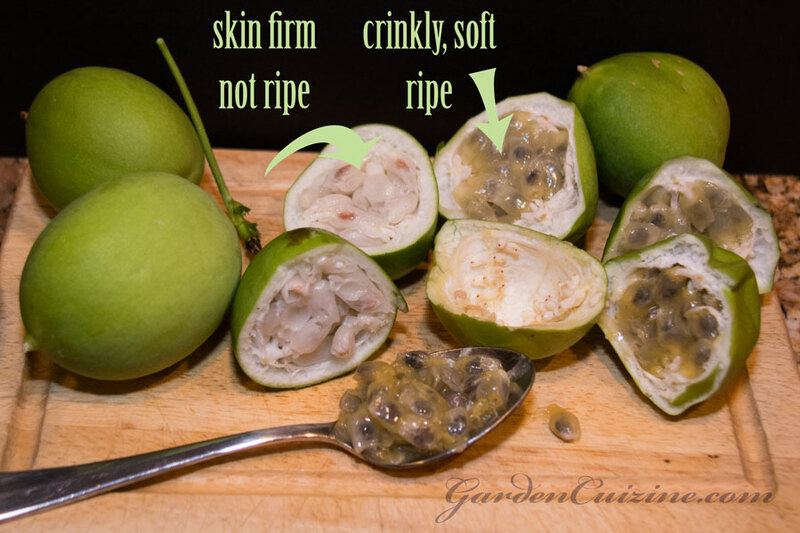 As they ripened, the skin color changed from lime green to a paler, yellow-green and the skins got crinkly and soft. And, the flesh around the small, watermelon-like seeds was juicy and translucent when ripe. Today, I decided to sacrifice a fresh picked firm fruit to see if there was a difference between the pulp of a paler, soft fruit vs a greener firm one. Test for ripeness by pressing the outside of the fruit with a finger - like poking a finger into yeast-risen bread dough to check readiness. Soft, ripe fruit will leave an indent; those are the ones I've been washing and cutting in half first. The pulp easily scoops out with a spoon leaving 3 rows of pithy, weird-looking bands along the inside walls of the fruit, which I imagine taste bitter like the pith of a lemon or lime. I tossed the skins in the compost and saved the juicy seeds in a storage container and froze it. I've been adding more to the container as the fruits ripen. There are different types of flamboyant passion flowers that yield different tasting fruits. For example, purple, more juicy fruits from Passiflora edulis, known as lilikoʻi in Hawaii, and some yield more banana-like shaped fruits. Ours is commonly known as Maypop - Passiflora incarnata. Stay tuned for Stage 3 - Passion Fruit Recipes and Nutrition Data!